*After appearing periodically in her sisters’ Snapchat, Kim Kardashian finally opened an account of her own this week – and daughter North West has already weighed in with her fears. “What?” asked Kim of her daughter in a Snapchat shared Thursday, with just her voice and tiny hand seen in the video. 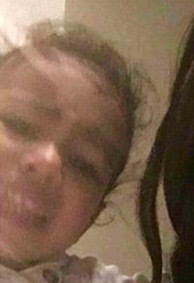 Soon after that clip, Kim shared a selfie with her daughter, who appeared to be in mid meltdown. “Not a snap fan,” Kim scrawled over the pic. Kim don’t force North to become an attention whore like you.